A silo is one of the most essential objects of infrastructure of a modern industrial enterprise, which provides for efficient storage of bulk solids while saving a significant portion of space. The application of such bunkers covers almost the entire process of storage of bulk solids, from short-term transshipment of railway, land and motor transport to long-term storage of grain, cement and other materials. Due to these characteristics, metal reservoirs of this type are widely used in construction, extractive industry, chemical industry, agriculture etc. OLAND produces and mounts silos of various volumes which would fully satisfy the needs of the customer’s enterprise. In addition to that, you can always count on intelligent design development, high-quality assembly and further reliable work of the bunkers. The use of advanced production technologies by the technical department of our company provides the clients with long-term storage and maintenance of optimum quality of bulk solids. All-welded turnkey storages completely ready for operation right after mounting on the foundation. Dismountable silos with “bolt” fixtures. Production of silos is carried out in accordance with the customer’s requirements. For instance, we can design and produce bunkers of a diameter up to 27 meters and capacity up to 10 thousand tons. Principal bearing elements: a stainless steel tank reinforced by structural ribbing of high rigidity, supports, a reliable foundation. Equipment for the needs of assembly: hatches, railings, ladders. Devices for loading/unloading of the content. Additional devices for control of temperatures and other key storage characteristics. Supplementary equipment can also be mounted, including cement filters, ventilation, control blocks, pressure release valves etc. Intelligent design of the bunkers depending on the required rigidity characteristics and calculated wind and snow load. A high level of technical security. Use of high-quality galvanized steel only, with up to 5 mm of coating in compliance with the State Standard. The possibility to produce high-volume bunkers both for outdoor and indoor mounting. Quality equipment for all projects, both typical and custom. Optimum price, which soon pays off by providing a more efficient and longer storage of materials at no risk of damage. 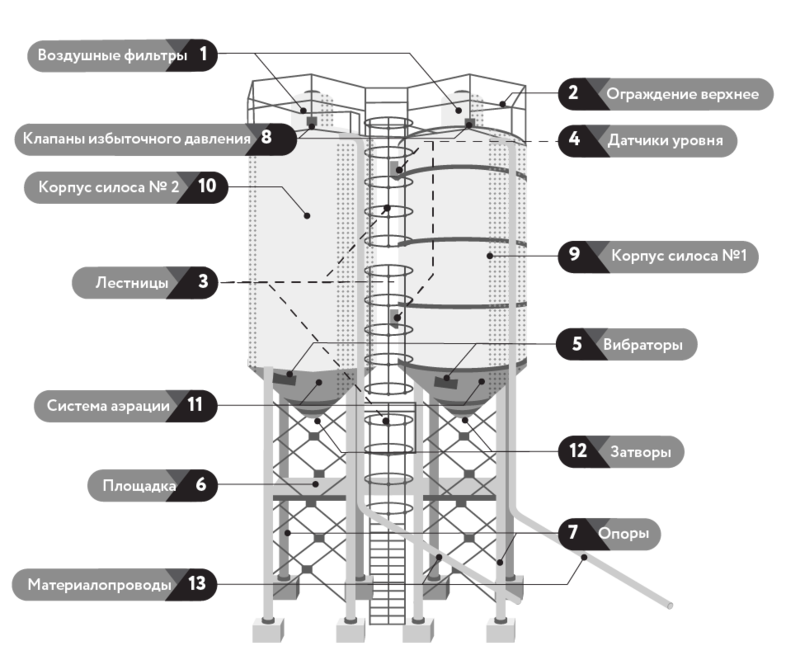 Professional mounting of silos with the use of the full package of equipment. The OLAND technology of silo production has already proven its results with years of successful operation both in Russia and abroad. We have the full range of cutting, rolling, welding, bending equipment, which allows us to comply with the State Standard requirements and obtain state certification. Call our experts right now and find out about the time frame and price of silo production for your company!